IGA-Ken Arena was happy to welcome Ms. Veejay Joson to practice last Saturday, July 5, 2014. Veejay is a member of the Phnom Penh Kendo Club in Cambodia, but she is a Pinay who hails from Pampanga and is an alumna of the University of the Philippines, Diliman. She discovered Kendo in Cambodia while working there, and has been doing it for around two years now. She is back home for a vacation, and wanted to see what Kendo is like back home. Originally she wanted to visit the UP Kendo Club, being that the school is where she graduated, but schedule issues arose and this was not to be. But she made one of her Saturdays free to visit the Arena Dojo, and she made arrangements with me to meet up with her and her family in UP last Saturday before going to the dojo. After a very nice lunch in Chocolate Kiss, I guided them to Arena Fitness. And once we arrived, Veejay started to prepare for her first keiko ever in the Philippines. In spite of an injury (skinned big toe), I saw that Veejay was all smiles during practice. She said that she really enjoyed herself, and hopes to make IGA-Ken a regular visiting point when she’s on vacation. Her family in turn were so thankful for the chance to actually see her in action, as it was their first time ever to see what Kendo is like. So practice ended with good feelings all around. So Veejay, we are looking forward to your next visit. Please give our warmest regards to Mori-Sensei, Mr. Kim and the rest of your dojomates in Phnom Penh. They are also certainly welcome to drop by for keiko should any of them find themselves in Manila. Finally, good luck and have lots of fun in the Vietnam Open next month! 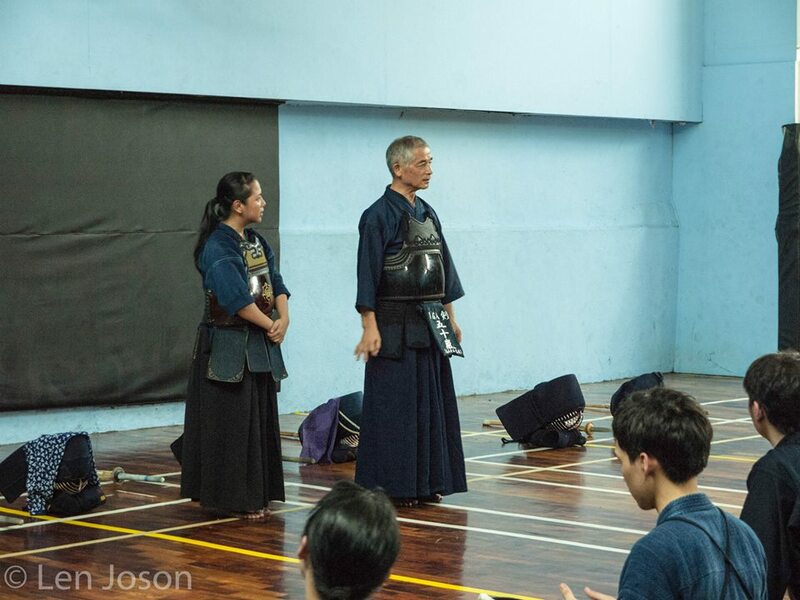 This entry was posted in Kendo, Socials, Stories / Testimonials and tagged Arena Fitness Dojo, Arena Fitness Inc, blogging, Cambodia, Diliman, Iga ken, Iga Kendo, IGA Kendo Club, Igarashi, Igarashi Sensei, jigeiko, keiko, kendo, Koji Igarashi, Martial arts, Philippine Kendo, Philippines, Phnom Penh Kendo Club, Quezon City, training, University of the Philippines, UP Kendo Club, Veejay Joson. Bookmark the permalink. ← Hello to Iloilo Kendo Club!